"Egg Florentine" is a classic dish which ticks all the right boxes especially after a long day's work when you want to relax and have a nice tasty meal. This when coupled with a nice creamy soup, makes a luxurious dinner. It can be had for breakfast, brunch - basically any time of the day. The ingredients are very simple, quick to assemble and tastes superb. All the ingredients are nutritious and easy on the pocket too. This recipe can be easy transformed into "Egg Benedict" by substituting spinach with ham and topping with white cheese sauce.The whole thing is served on a savoury muffin .... yummy, isn't it!!!!! Actually the tomato sauce used in this recipe is home-made which I should have posted earlier. So apologies for that and I will post it in the next couple of days. Usually the eggs are poached but I cooked the eggs in the microwave which took around 30-40 secs. Garlic pods [sliced thinly]: 3-4. 1.Heat a non stick pan on medium flame and add the spinach and sliced garlic [no oil needed]. 2.Sprinkle the water and cover with lid. 3.After 5 minutes stir the spinach once. Add all the powders and salt. 4.Cover and cook for a couple of minutes. 5.Put off the flame and keep warm. The original version is to poach the eggs - Simmer a pan with 1/4 filled with water with a splash of vinegar or salt. Break the eggs one by one very carefully into the water. Cook for a couple of minutes until the whites are set and the yolks are soft. Remove from water and keep warm. I had this funny device with which the eggs can be cooked in the microwave. It was basically like shallow flan tins. You just need to add a couple of tablespoons of water, break the egg one in each case and cook for 30- 40 secs until set. Tomato salsa/ tomato sauce: 3-4 tbsp. Wilted spinach : 1 cup. 1.Toast garlic bread as per packet instructions. 2.Spread a tbsp of tomato sauce/ salsa on the garlic bread. 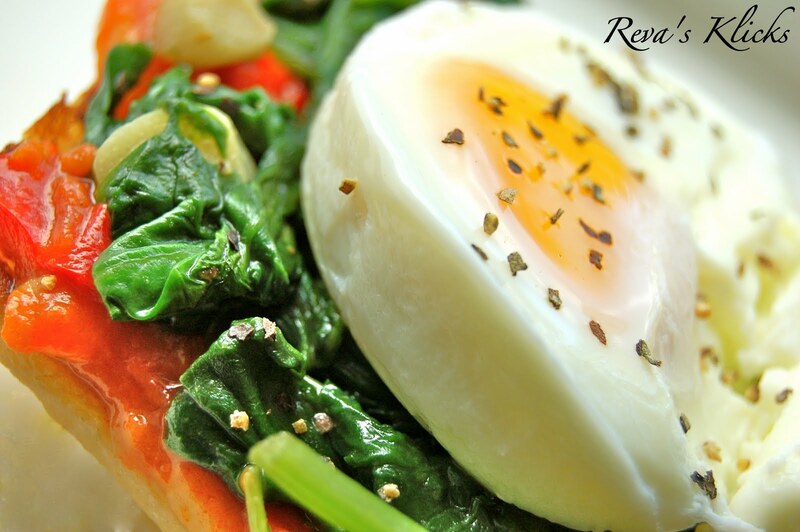 3.Arrange 2 tbsp of wilted spinach on top of the tomato sauce layer. 4.Top with poached egg and sprinkle with salt and pepper. Note: The garlic bread can be substituted with thick slices of wholemeal bread. For more decadence sprinkle the florentines with grated cheddar cheese and warm in microwave for about a minute until the cheese is just melted. Sending this to "Cook it Healthy- Proteinicious" , an event by Shobha. Yummy treat with egg..looks delicious!! 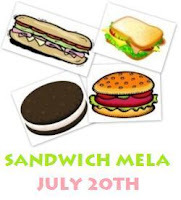 wow, the sandwich looks amazing, just love it, simply superb dear, sure to try this out..and thanx a lot for linking it to my event. Very simple and healthy dish. That looks like a delicious and healthy breakfast..love the shots!! As usual! Great photography & the dish looks luxurious! Hi Reva, did you check my email on hosting the veggi/fruit a month event for July? Are you ready? Please respond me back. So tempting and delicious dish.. simply inviting dear !! Amazing looking sandwich. Must have been finished within minutes. Thats so marvellous and salivating sandwich..
Makes for a delightful & healthy breakfast!!!! healthy and perfect breakfast !! Wow..I agree that you are an awesome cook..Why you know ? to poach an egg like that,you need spl talent..Awesome Recipe ! Hey Reva, this sounds and looks like an awesome sandwich! Perfect shaped eggs & Cooked nice...Looks so tempting..
A delicious and healthy sandwich, looks marvelous! Woww.. egg florantine.. Awesome .. I have to try htis.. i love this recipe.. :D Thank you.. Congratz!! You are the lucky winner of our "Quick and Easy Recipe Mela". We have awarded you a "Badge". Please come and collect it.